This year I was celebrating the new year on the beach. So obviously I needed a cider that was a bit special as an accompaniment to the celebrations. I picked up a bottle of Burrow Hill Kingston Black Dry cider at the Truckles Farm Shop in Burnham-on-Sea where we were staying, along with a couple of flagons of Rich’s Dry Scrumpy Cider. It was on the pricey side at £13 for a 750ml bottle. The cider pours a deep orangey-amber, and fizzes like posh sparkly wine. The bottle looks like that of posh wine too with a proper poppable cork wired on to the top. Certainly the kind of thing to drink at new year. 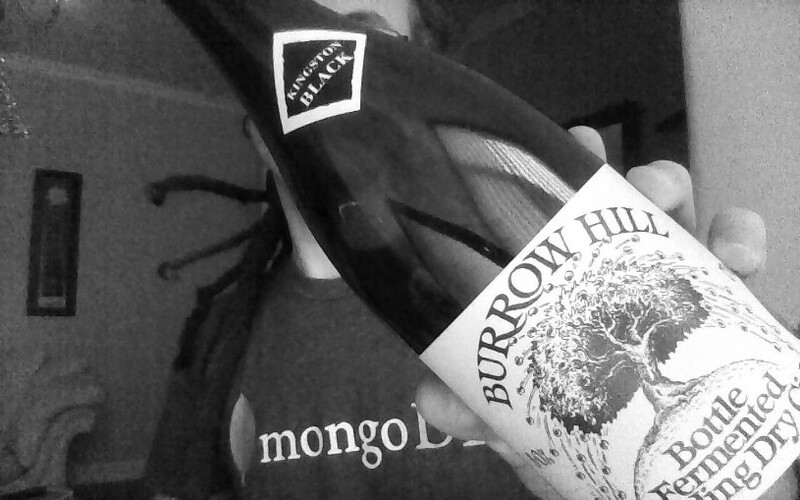 But Burrow Hill Dry is more muscular, with a deep, oaky smell and the bittersharp of the Kingston Black apples. The cider is rounded and complex and very full-bodied. At 8% you’d hope that it would be. It has a very different character to, say, Ciderniks Kingston Black — another single variety Kingston Black which I adore. Undoubtedly this is because it is bottle fermented — unusual for a UK cider. So it ends up more like Aspalls with attitude. The makers, The Somerset Cider Brandy Company are clearly passionate about making good booze. And it shows in this tipple as well as in their cider brandy — which I also sampled, for research purposes of course!